Amid the ever-changing nightlife landscape of Los Angeles, a select few venues have stood the test of time. Some of the city’s iconic bars, in particular, bring to mind the city’s past while carving their own niche in its future. Hollywood deal-makers and ingénues have frequented the legendary Polo Lounge at the Beverly Hills Hotel for decades, making it one of L.A.’s most iconic watering holes. 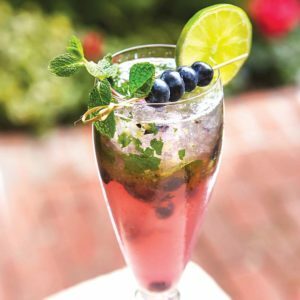 Whether stopping in for breakfast, dinner or meeting for cocktails, the Polo Lounge has entertained generations of Angelenos. The inventive cocktail menu at the signature bar at the “Pink Palace” includes the Think Pink, Grey Goose infused with strawberry, agave and lemon juice; Blueberry Lavender Fizz, vodka mixed with blueberry, lavender, lime, fresh mint and club soda; Barrel Aged Manhattan, with Eagle Rare bourbon, ruby port and Aztec chocolate bitters; and the Frontier Eclipse, with Bulleit Rye bourbon, Cherry Heering liqueur, strawberry lemon agave syrup, walnut bitters and star anise. And the menu at the hotel’s Polo Lounge this fall will be “all about heart,” according to Kaleo Adams, the hotel’s executive chef. “Look for inventive salad selections that include chicories for added spice and bite, complemented by apples and pears,” he said. Rich homestyle soups will be served for the first time, and favorites like the chicken pot pie will return. “To dine at the Polo Lounge is to be connected with Hollywood’s earliest days, its Golden Era, and a bright future,” said Brittany Williams, the hotel’s director of communications. The Polo Lounge is located at 9641 Sunset Blvd. in Beverly Hills. It’s open daily from 7 a.m. to 1:30 a.m., including a jazz brunch on Sundays from 11 a.m. to 3 p.m. and afternoon tea on Fridays and Saturdays from 3 p.m. 5 p.m. 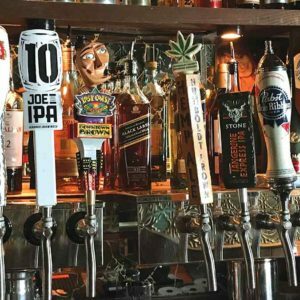 Located along an unassuming stretch of La Brea Avenue, Little Bar has endured as a “total neighborhood” bar on the Miracle Mile in a city known mostly for its trendy nightclubs, as far as nightlife is concerned. Instead of the most popular DJs and bottle girls lowering from the ceiling a blaze of fire sparks, the bar’s entertainment includes the more time-honored darts and a jukebox. It’s trivia nights are also popular. The drink menu consists of craft beer and creative cocktails. The bar doesn’t serve food, but welcomes patrons to bring their own, or have it delivered. The bar’s decor also includes a wall of license plates and a neon green, glowing mermaid hovering above the center of the bar. “This is where people in the neighborhood just come to socialize,” Aquino said. Little Bar is located at 757 S. La Brea Ave.
Musso and Frank Grill has been a Hollywood staple for almost 100 years, even predating the iconic Hollywood Sign. 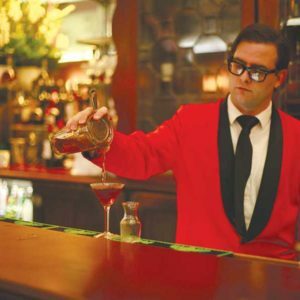 The martinis mixed by its bartenders have become just as much of a local fixture over the years, earning accolades and recognition from media and patrons of all sorts. GQ Magazine once called them the best in America. Frank Toulet and Joseph Musso opened the restaurant in 1919, with the help of French chef Jean Rue, creator of the original menu and executive chef for 53 years. Its specialty dishes include Sauerbraten, corned beef and braised short ribs of beef with mixed vegetables. Celebrities from Marilyn Monroe to Mick Jagger have frequented Musso and Frank, along with writers like William Faulkner, F. Scott Fitzgerald, T.S. Eliot and John Steinbeck. With more recent development concentrated in Hollywood, the restaurant has become popular among an increasing number of local residents. Musso and Toulet sold the restaurant in 1927 to Joseph Carrissimi and John Mosso, two Italian immigrants, who moved the restaurant to its current location. It’s still owned by both families, standing as a tribute to Hollywood’s Golden Age. Regulars have returned for decades, served by many of the same members of the wait staff. Musso and Frank is located at 6667 Hollywood Blvd. It’s open from 11 a.m. to 11 p.m. Tuesday through Saturday, 4 to 9 p.m. on Sunday, and closed on Monday. For information, visit mussoandfrank.com.